So last week when I first started trying to get my long dormant XR out of the garage, I discovered that when I turned the ignition switch, the starter was not being activated. I was able to short across the main two electrical posts on the solenoid and the starter engaged so I figured the solenoid was faulty but when I pulled the solenoid and tested it on the bench it worked fine. So I cleaned all of the ends on the wires connecting to the various terminals and I changed the push on connector end on the wire that comes from the starter switch to a solidly connected eyelet held onto that terminal with a nut. So when I finished all of this I tested it and it seemed to work fine. This morning I finally finished the cleaning of the fuel system, so I reassembled the fuel hoses that I had removed from the fuel rail and tried to start the car. DAMN! It was back to not working. ARGH! So I jumped across the two main big terminals on the solenoid and the starter activated, I then jumped power from the main input power terminal on the solenoid to the small post where the wire from the ignition switch connects, that worked the starter as well. So now I figure I either have a bad starter switch or a crappy wire leading from the starter switch to the terminal on the solenoid. OK, I pulled the plastic cowling off from around the steering column and I found that the signal does get to the right output terminal on the ignition switch when the key is turned to the starter position. Sometimes the solenoid actually gets activated but only about one in ten times of turning the key in the ignition switch. So it must be some intermittent connection in the wire leading to the terminal on the solenoid. The good news is that when the solenoid does get activated, the car starts with the fresh gas now. All I have to do is to fix this intermittent connection in the wire to the solenoid then I am golden. I see two black with green stripe wires connected to the terminal on the ignition switch that gets activated when the switch is turned to the start position but I don't know where both of them go. Where can I find a wiring diagram for a 1987 XR ? Is there one here on the site anywhere or perhaps someplace else online? When you bridge the gap on the solenoid posts the starter engages and the solenoid bench tests OK? I would look at the neutral safety switch on the transmission. It won't let the starter engage if it thinks the transmission is in gear, BUT you can override it by bridging the posts on the solenoid. BTDT a bunch of times automatic and 5spd XRs. Thanks for the reply Mike. Yes, to both questions. I tested the solenoid on the bench by grounding the mounting bracket of the solenoid to the negative post of my battery and then jumping power to the small start post and the solenoid makes the loud engagement click every time. Also if i take a screwdriver and jump between the two big posts on the solenoid while it is all wired up and bolted to the inner fender, the starter does engage every time. Do you have a spare XR4Ti electrical guide book for sale? So Mike was kind enough to send me PDFs of the ECTM and a wiring diagram. 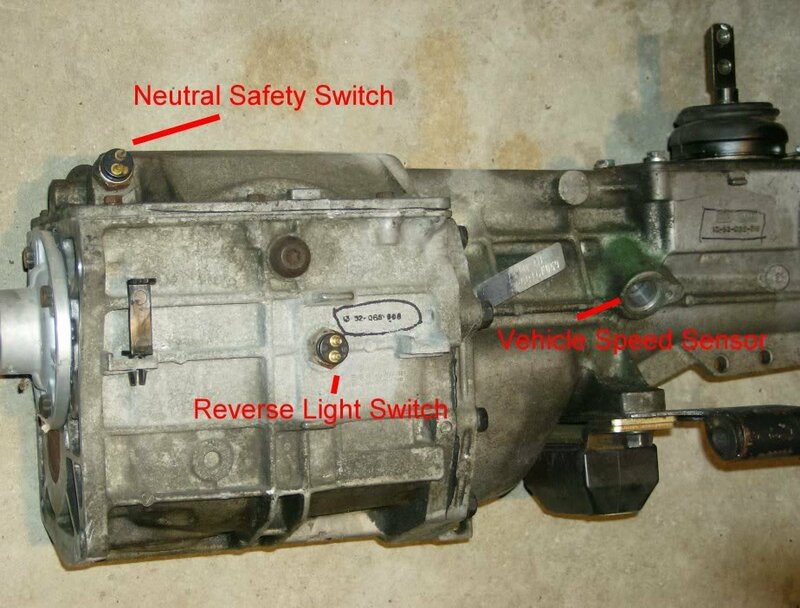 From looking at the EVTM, I see that between the ignition switch and the starter solenoid, is a neutral start safety switch. Where is this located? Is it directly on the transmission? This car has a T5 swap in it so it no longer has the original T9 transmission. Could this neutral safety switch be the cause of my problems with not reliably engaging the starter solenoid when I turn the key? I have the car in neutral but perhaps this switch is not reliably recognizing that. Maybe the switch contacts are corroded from sitting in the garage for years? I had a similar problem when my car had been sitting out in the Arizona sun unprotected. The ignition switch would get hot, and the starter would not engage, or sometimes had a delayed engagement (not fun), depending on how hot it got... I learned to ensure that there was always a shade installed, and or a towel tossed over the steering column, when parking in the sun. Once the thing cooled off, it would work normally again, and it was never an issue in the Winter (or, I should say, the non-Summer). What I thought of doing was replacing the keyed switch with a starter button (which would fit nicely where the old stereo joystick control once resided), to simply eliminate the problem. Of course, this was a lazy way of addressing the real issue, but having a starter button is infinitely sexier than turning a key, so... in any event, I never got around to that, either, since ensuring the steering column was always shaded prevented the issue from reccurring... but I think it's worth finding out if the problem is with your switch, even if it's not heat-related. Thanks for the suggestions and information. This car is sitting in an unheated garage in NE Ohio where the average temperatures right now are in the low 40's to mid 50's. This problem occurs reliably even when I walk out to a completely cold car and turn the ignition switch one or two times so I don't think in my case it is an overheated switch. I used to live in Chandler Arizona and Scottsdale Arizona so I have direct first hand experience of how damn hot it gets out there. I will keep this in mind if the car ever gets out there again. In the mean time I plan on pulling the transmission tunnel apart later to see if I can find something resembling a neutral safety switch to see if I can clean it up or otherwise fix it. At the very minimum I plan on confirming if the power signal is reliably reaching this switch once I find it and if the problem is due to some fault of the switch. As I mentioned, I'm not saying it's necessarily heat-related, but that it may be in the switch. If your car had worked previously with the current transmission setup, I think that would tend to rule out the NSS, but maybe the wiring connection came loose down there. I hope you resolve it soon, and are once again on your merry way. So I have discovered earlier this afternoon that if I wiggle the shifter around a bit before trying to engage the starter, it seems to help to get the system to function as normal. So I really think my problem is centered around this neutral safety switch that I am guessing is actually located near the shifter assembly on top of the transmission. Since this car has been converted to a T5 transmission I have no clue if this is a standard switch from some other car or not. I guess I have to tear the trans tunnel interior bits apart to get to the top of the transmission to determine what the switch looks like. On a T5 the NSS is way up front near the bellhousing so you won't be able to access it from the inside of the car.